The nonlinear PCA is based on an auto-associative neural network (autoencoder), see also: www.nlpca.org . 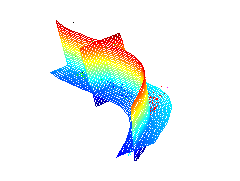 pc = nlpca(data,k) extracts k nonlinear components from the data set. pc represents the estimated component values (scores). net is a data structure explaining the neural network parameters for the nonlinear transformation from data space to component space and reverse. net can be used in nlpca_get_components and nlpca_get_data to obtain component values (scores) for new data or reconstructed data for any component value. In this example nonlinear PCA (circular PCA) is applied to artificial data of a noisy circle. See also the demos of the toolbox. The NLPCA toolbox is distributed under the GNU General Public License. Validation: Validation of nonlinear PCA. Neural Processing Letters, Volume 36, Number 1, Pages 21-30, 2012.
review (book chapter): Nonlinear principal component analysis: neural network models and applications. Matthias Scholz, Martin Fraunholz, and Joachim Selbig. In Principal Manifolds for Data Visualization and Dimension Reduction, edited by Alexander N. Gorban, Balázs Kégl, Donald C. Wunsch, and Andrei Zinovyev. Volume 58 of LNCSE, pages 44-67. Springer Berlin Heidelberg, 2007. Circular PCA: Analysing periodic phenomena by circular PCA. In S. Hochreiter and R. Wagner, editors, Proceedings of the Conference on Bioinformatics Research and Development BIRD'07, LNCS/LNBI Vol. 4414, pages 38-47. Springer-Verlag Berlin Heidelberg, 2007. Inverse model, missing data: Non-linear PCA: a missing data approach. Matthias Scholz, Fatma Kaplan, Charles L. Guy, Joachim Kopka, and Joachim Selbig. Hierarchical NLPCA: Nonlinear PCA: a new hierarchical approach. Matthias Scholz and Ricardo Vigário. In M. Verleysen, editor, Proceedings ESANN. 2002.